The family-run 3-star Hotel Adriatico is located just a few minutes walk from the beach and in a central position. It offers free indoor parking, a large garden and air conditioning. Accept small and medium-sized animals. 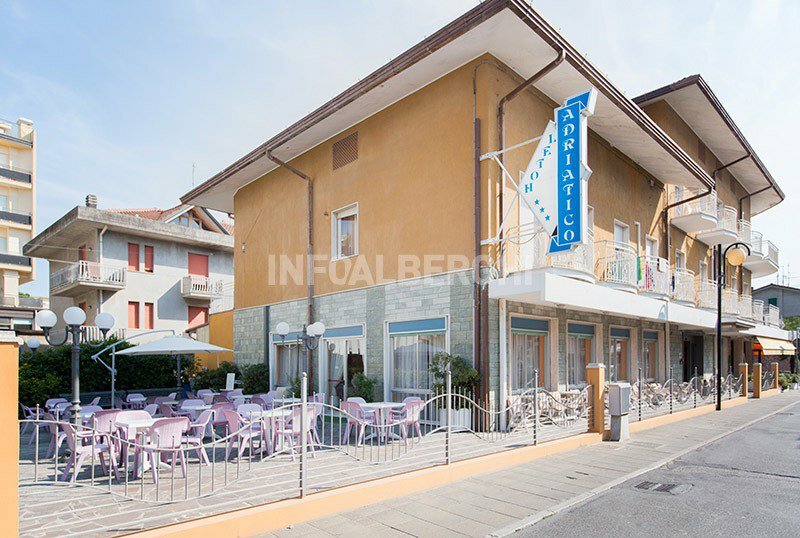 The hotel is located in the center of Bellaria and is only a 2-minute walk from the sea. A few steps away is the pedestrian promenade of Via Guidi Paolo, from which you can reach the train station in less than 10 minutes. The structure is also very close to the bus stops. All rooms are equipped with safe, fan and air conditioning (with a surcharge), telephone, digital terrestrial TV and bathroom with shower box or curtain. Some rooms have a balcony. Large garden, open-air porch and outdoor playground area. Theme nights are organized. PARKING: private and open, available to all customers. AIR CONDITIONING: available in the room for a surcharge. PETS: accepts small and medium-sized animals. BREAKFAST: continental with homemade desserts. LUNCH AND DINNER: 3 choice menu based on meat and fish with dishes inspired by the Romagna tradition. Pasta and desserts are homemade. At meals: baby menu and seats at the table. At the beach: baby club with entertainment. The hotel has an agreement with Bagno Paguro Beach, just a few steps away from the hotel. It offers beach volleyball courts, bowls, table tennis tables and a wide range of services for all guests: newspapers, books, magazines and WI-FI. Among the activities proposed yoga, pilates, shiatsu and oriental dances. Baby club for children, pets welcome. Prices are per day, per person. - No deductions for un-consumed meals are included in the price. - The meal not consumed on the day of arrival can not be recovered on the day of departure. - On request a luggage will be delivered in lieu of missing meals.